The New Toxic Meltdown is a Blast! 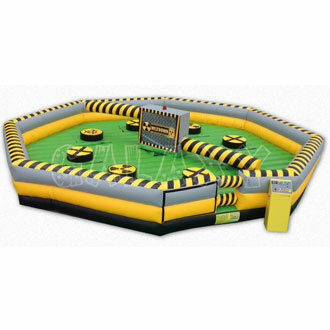 Description: Toxic Meltdown is our 8 player action game, which challenges your stamina, agility and reactions. Not one but two spinning boom arms try to knock you off your podium. You have to duck underneath or jump over the foam boom. Who will be the last one standing? The game is housed in a 30' x 30' (9.7m. x 9.7m.) octagon inflatable, with 8 removable podiums for your participants. The bright green contrasts beautifully with the black, grey and yellow for a vivid toxic meltdown theme.